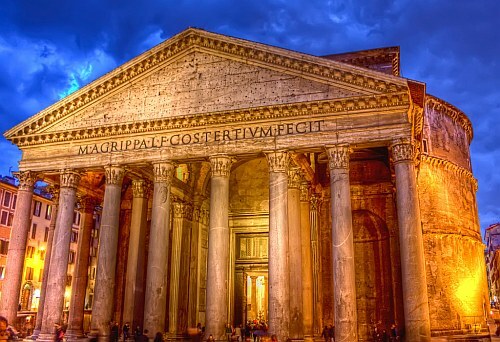 American Airlines and British Airways have dropped the price of their off-season flights from Seattle to Rome, Italy down to between $547 and $575 CAD roundtrip including taxes. This is about half the current prices of the cheapest flights from Vancouver on any date in 2018. The flights have 1 stop each way (Philadelphia or London, UK). There are also similar flights from Seattle to various other places in Europe, such as Milan, Venice, Paris, Nice, and Amsterdam. Some flights may be with Finnair, Alitalia, or Iberia. Also note that you *may* be able to find similar prices from Bellingham (BLI) but with an extra stop in Seattle. Most of the time it will probably work out to be faster to just depart from Seattle. Look for the dates that are in the $500s CAD roundtrip. I would avoid the flights where an airport change is required in London. Search for a flight from Seattle to Rome, Italy (FCO) or one of the other cities in Europe. Try the dates you found on Google Flights. NOTE: Most of the booking sites showing these flights are priced in $USD (even though Momondo is showing you the approximate price in $CAD), so watch out for that. TIP: After your Momondo search completes, you may want to try setting the Max Flight Duration slider on the left to about 36 - to get rid of ridiculously long flights that are slightly cheaper. You may also want to select '1 Stop Flights' on the left hand side. Update 11/6 - After disappearing briefly, some of these have returned today. There are flights from Seattle to Rome, Milan, Paris, and Amsterdam for $575 CAD roundtrip and under. - Follow the steps above. Update 11/13 - Some of these flights from Seattle to Europe have dropped a little bit more in price today. Others have gone up in price. In the list at the top of this blog post, I've placed them in order of realistic price, based on what I've seen for a 1 stop flight with good connections. Update 12/21 - These off-season flights from Seattle to Europe in the mid $550s to mid $650s CAD roundtrip are back again. There is now also availability in late October to mid November 2018. - Follow the steps and Google Flights links from the top of the blog post. Update 2/5 - Off-season flights from Seattle to Rome, Italy have returned today for $514 CAD roundtrip including taxes. - You can also find cheap off-season flights from Seattle to various other places in Europe using the links at the top of this blog post. - Look for the dates that are between $592 and $601 roundtrip. - Look for the cheap flights in March, late November, and December 2018. TIP: Once your Momondo search completes, try sliding the Max Flight Duration slider on the left down to around 36, to filter out really long flights. You can also try selecting 'Max. 1 Stop' on the left hand side. seattle, sea, europe, american airlines, western europe, italy, rome, fco and british airways.